Buenos Aires (VNA) – Permanent Deputy Foreign Minister Bui Thanh Son affirmed that Vietnam always supports and treasures South – South cooperation in his speech delivered at the plenary session of the second High-Level United Nations Conference on South – South Cooperation in Buenos Aires, Argentina on March 20. Son, who is also head of the Vietnamese delegation, said his country pays attention to promoting development cooperation with developing countries within bilateral, Greater Mekong Sub-regional, ASEAN and regional frameworks. Vietnam launched over 10 trilateral projects, including sending over 300 experts to African countries to transfer technology, offer training and support agricultural development, making positive contributions to reducing poverty and ensuring food security in Africa. He shared lessons learnt from South – South cooperation projects, including harmoniously combining Vietnam’s ability with demand of developing countries, ensuring practical benefits to local residents, effectively combining development partners’ financial assistance with Vietnam’s technical expertise. The Deputy FM said Vietnam has been sharing its experience in renovation and global integration with developing nations, especially economic reform in tandem with active and proactive global integration, and ensuring economic growth, environment protection, cultural development, social progress and equality, poverty reduction, agriculture, education and health care. 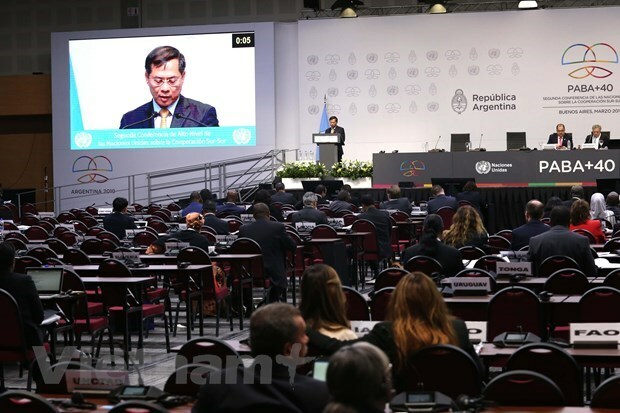 He stressed that South – South cooperation needs to continue strengthening solidarity, voices and common interests of developing nations in global issues, especially promoting multilateralism and fulfillment of the UN Sustainable Development Goals. Son asked the UN and development partners to continue supporting South – South collaboration for a world of peace and common prosperity. On the occasion, he also delivered a speech at the opening ceremony of “Dialogue with Asian countries” hosted by the Argentine Foreign Minister, met bilaterally with heads of the delegations from Norway, Armenia, Iceland, Maldives and Ghana, and the Director General of the UN Development Programme. The Vietnamese delegation actively discussed at the dialogue “Shaping the Future of Regional South-South Cooperation: Sharing the ASEAN Experiences and Nurturing Synergies across Regions”. The telecom provider Viettel presented a report at the dialogue on prospects of South – South and trilateral cooperation: the Asia – Pacific’s contributions to science, technology and innovation. The conference was held on the occasion of the 40th anniversary of the Plan of Action for Promoting and Implementing Technical Cooperation among Developing Countries.